Design your tie and have it printed to order. Be original and create custom ties printed with your images, text, motif, logo or art. Design a neck-tie for Dad, for work, your club, or just for fun. Company ties and men's personalised neckties you design online, now with a five-year guarantee. Design your tie online with photo, text or logo. We print the entire length of the tie and both sides too. Choose from two styles; skinny or wide; and no minimum order. You can design your own tie online using your ideas in our creative tie design system. Choose from limitless background colours, endless choice of words or a combination with images logo or other graphics. Bear in mind the long thin shape before you design your tie. Whilst this is not ideal for all photos, it does work well for a montage of photos to create a collage tie and for long tall subjects. You can try out a collage tie design, using our free collage maker in our design system. 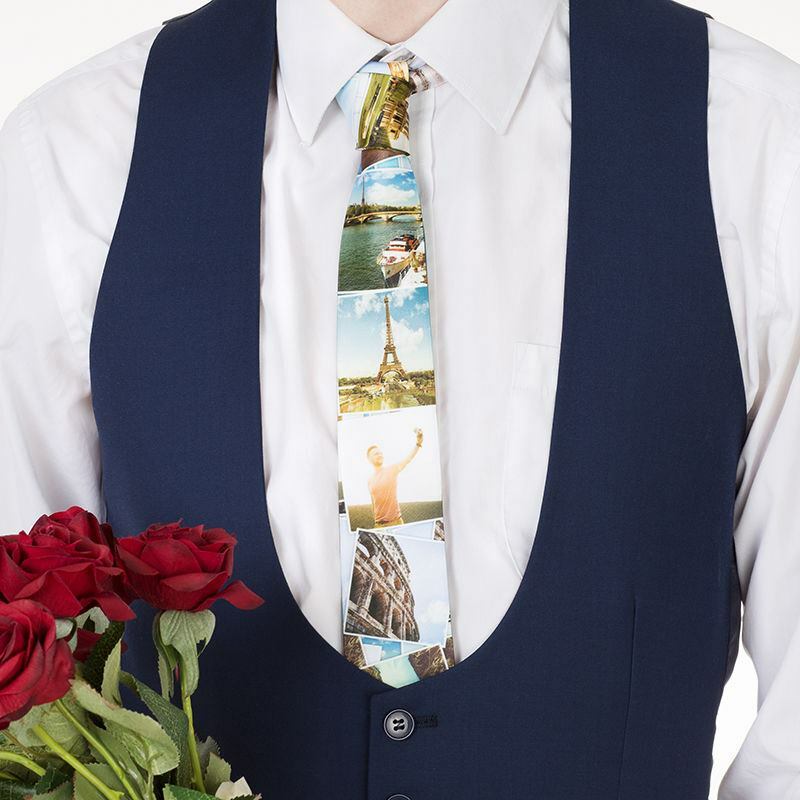 If you want an original idea for a friends new marriage, then custom ties for weddings can add an unusual flare. We are a group of national trust volunteers who wanted a unique gift for our day coordinator in honor of his 70th birthday. He loves ties and only gets to wear them at weekends so it was brilliant that we could use a photograph of a unique item in our Tudor house and have that reproduced on a tie! It was such an easy process, and the quality of the item is superb and excellent value for money. It went down very well when we presented it to him! He was thrilled to bits! Fab quirky item My hubby loves it! As well as giving you complete control of the design of your custom-printed tie, we also wanted to give you a choice of styles. Choose from a super trendy skinny tie or a classic wide tie. Both styles reflect the same level of superb craftsmanship, with photos or designs printed to the highest quality. Our custom printed tie is prepared carefully so that we can print the back of the photo tie in addition to the front. We have no minimum order for personalised neckties. You can order one at a time or more. Just create a tie design in our preview and you will see it in a day or two. Our custom ties can be made online the same day for next day delivery. It's custom printed to order and if you get your order in soon enough, usually before midday, we can make and send your order with next day delivery service. Care: The tie is made from a high-quality smooth satin with a slight sheen, long-lasting print both sides. Keep flat. Dry clean only. Do not put in the washing machine. Iron safe. Guaranteed: Five-year guarantee on print, material and stitching finish. If you are planning to place a bulk order with us, please contact the customer service team for all the information about the wholesale discount we can offer you. Though we know the back of your tie isn't visible when it is being worn, due to popular demand we offer the option to add print on the back of the tie. The white seam is naturally visible down the centre of the back of the tie (see photo gallery) and does not impact the overall quality of the product. This tie does not have a keeper loop to slide the tail of your custom tie through, it is self-tipping. We use a heat-press process to infuse the water-based inks deeps into the fibres of the fabric. This creates a long-lasting print without altering the texture of the silk like material. Make your own printed personalised tie or necktie with a personal touch and give as a gift to someone special. Enjoy a creative experience with us and make personalised ties for a special event for that added touch of magic. This is a great personal gift for a man, husband or father. These neckties are made in England with excellent print techniques. Enjoy keeping manufacturing in the UK and make someone happy at the same time with your personal gift tie. The great thing about this promotional ties service is they can be used for all sorts of things, you can even make club ties, event ties and corporate ties, you can even add a face on there or many faces. So if you need a bespoke club tie or one-off event ties then our on-demand service is perfect for you. You can make country flag customised ties or witty wordy ties, keep calm or just personal photo ties. Promotional company ties are popular too so try and design unique ties online with a picture or logo. It's easy and fun.